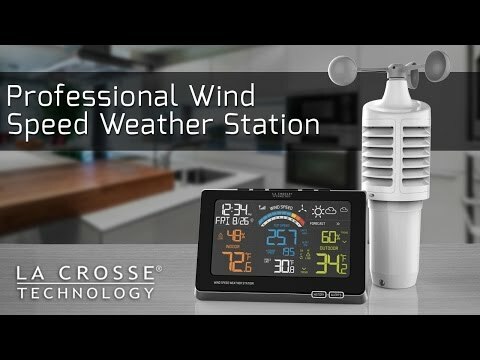 "Not so great weather station"
I am very disappointed in this product. Ever since we set it up, following the directions, it has gone in and out on the outside temp. I set it on 1 unit, still kept going in and out. Now, the outside information is not showing at all and I have had the product for about 1.5 months. This is very unprofessional and I will never buy another La Crosse station. I am going to look into returning it to where I bought it and look for something else. They should not fail this quickly. I know it is within the correct range for getting information, but even when it was working, it never registered the wind at the correct speed. Thank you for your feedback. We apologize you are having problems. If you have not returned the product yet please contact us for Technical Support. We can and will fix this as La Crosse Technology, Ltd. provides, to the original purchaser, a 1-year limited time warranty (from date of purchase) on this product, relating to manufacturing defects in materials & workmanship. The item will be either repaired or replaced at La Crosse Technology's discretion. Please contact Technical Support via the Support Tab web form link or contact them directly M - F 8 AM to 6 PM CST at 608-782-1610/888-211-1923. "Professional? Not! Just a bad toy." Tech support confirms that this unit has an accuracy of plus or minus TWO degrees, meaning that at normal room temperature of 20 degrees Celsius, it could display as low as 18 or as high as 22. This is not publicly documented anywhere that I can find. However, the fact that the unit displays the temperature in point one degree increments certainly hints at a decent degree of accuracy. To call a unit "Professional" that may, by design, read wrong by TEN percent is just plain misleading. Thank you for your feed back. We apologize you feel scammed. We see you worked with our Technical Support representative on 03/02/17 who provided you with our tolerance information. What you stated above is correct the tolerance is +/-2º Celsius or Fahrenheit.